Good nutrition in early childhood affects all aspects of growth, including brain development, which in turn can impact success in primary school and on into adulthood. In fact, a child who receives the right nutrition during the first five years is much more likely to be healthy for the rest of his life, says Sandra Gabriele, a Toronto registered dietitian specializing in pediatrics. SheKnows asked for some basic tips for parents to make sure their toddlers are getting their daily dose of essential vitamins and minerals. To get the best nutrition from snacks, offer nutrient-dense fruits — fresh apple slices with honey for dipping, vegetables such as finely cut carrot sticks, fat-free or low-fat dairy with a little maple syrup and fresh berries, and whole grain snacks, such as whole wheat crackers or baked whole wheat pita triangles. Try to include foods that might be missed at meals and contain a toddler-sized serving from at least two different food groups. Hide pureed fruits and vegetables in other foods – you can’t taste pureed carrot in peanut butter, we promise! Let toddlers dip their veggies in dressing – it makes eating more fun and interactive. Cut sandwiches into fun shapes – dinosaurs are popular, if you can manage it. Try animal cookie cutters for inspiration. Make funny faces with vegetables – who can resist a happy face? Make fruit milkshakes – it’s a tasty way to combine fruit, dairy and a sprinkling of ground nuts or spoonful of nut butter for added protein. You can sneak in a bit of fresh baby spinach, too! 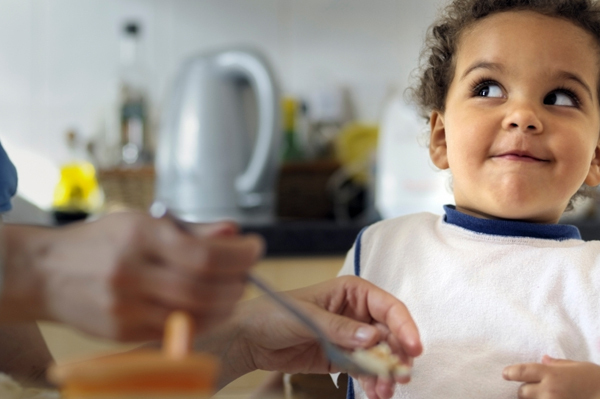 Eating a variety of foods is the best way to ensure your toddler gets the nutrition she needs. We know that toddlers can be finicky, and getting all the foods they need on a daily basis can be challenging. Taking a multivitamin might not be an option for 1- to 2-year-olds, but they can take a milk-based nutritional supplement, such as Gerber Graduates Toddler Drink. Made specifically for 1- to 3-year-olds, this liquid supplement contains essential vitamins and minerals to support a toddler’s growth and development. Should you force your toddler to eat?